Manila, Philippines - The Department of Transportation and Communications (DOTC) announced this week that new and modern license plates from Land Transportation Office (LTO) will be available by September 2013. “The public can start enjoying the benefits of cutting-edge standardized license plates before the end of September. They need not wait much longer,” DOTC Spokesperson Michael Arthur Sagcal said. The new license plates from LTO will differ for motorcycle (MC) and motor vehicle (MV). Before the end of September, new design will be released. The MV plates will now have a three-letter, four-number combination, and the MC plates will have a two-letter, five-number combination. The private vehicle plates will also come in a black-and-white design, with a look similar to those in more advanced countries such as Singapore and parts of Europe. 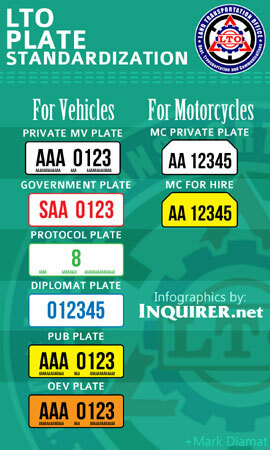 Check here for more detailed illustration of new and standardized LTO plates. The new security features will prevent tampering, theft, and falsification of license plates, mitigating carnapping, colorum, and smuggling practices. This is in accordance with international quality standards, Sagcal said. The five-year contracts for the supply of motor vehicle (MV) license plates, amounting to around P 1.989 billion, and the supply of motorcycle (MC) license plates, amounting to around P 1.196 billion, have been awarded to the joint venture of J. Knieriem B.V. Goes and Power Plates Development Concepts, Inc. The DOTC will now have 10 days to finalize the supply contracts, after which a Notice to Proceed will be issued to the winning bidder. The consortium will then have 30 days to deliver the license plates to the LTO. With respect to various issues raised by losing bidders and other interested parties in connection with the bidding out of this project, the DOTC said it has already addressed their questions satisfactorily. “What matters is that the DOTC conducted an open, fair, and transparent bidding in accordance with procurement laws,” Sagcal added.